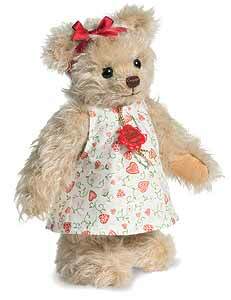 Teddy Hermann Emma Bear is fully jointed and made of the finest blonde mohair. She wears a white cotton dress with hearts on and a red ribbon around her ears. Comes boxed with numbered certificate. Item number 117278, black safety eyes, synthetic filling, mohair material is surface washable only. Non Growler, Size 17cm tall.